Cyclops is a genus of small freshwater crustaceans (copepods) characterized by a single eye spot on the head segment. Cyclops sp. also feature antennae, a segmented body, 5 pairs of legs, and a divided "tail" called a furca. 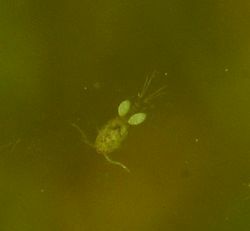 Although Cyclops look similar to Diaptomus copepods, the distinguishing characteristic is that Cyclops females carry two egg sacs. There are over 100 species of Cyclops, most ranging between 1-5 mm in length, and are usually omnivores which feed upon algae, and other small organisms which can even include fish larvae and weakened fry. Although faster than similarly sized Daphnia, Cyclops are an important part of ecological systems where they are the natural prey of large fry, small fish, and other aquatic organisms such as hydras, and White Mosquito Larvae. Cyclops are also important in the life cycle of many freshwater parasites such as cestodes (tapeworms), and nematodes (roundworms). These animals are harmless in an aquarium to all sizes of fish or other aquatic animals. They are not parasitic and are indeed eaten by small fish. As an adult Cyclops grows to 3-5mm in length there is a slight possibility that if in large numbers they may be able to catch very small fry and harm them. In that case adding a small tetra like a Neon tetra or similar will quickly enjoy eating them. Cyclops should only be collected from bodies of water that do not contain fish to reduce the risk of parasitic infection. Cyclops are available in frozen form. This page was last edited on 8 February 2011, at 16:19.